Ben Benn was born with the name of Benjamin Rosenberg in 1884 in the town of Kamenets Podolsk, Ukraine. This town was the regional capital of an area in what is today, South West Ukraine, and was historically known as Podolia. His family chose to immigrate to the United States in c. 1894 to reside eventually in New York City. Between 1904 and 1908 he studied at the Arts Students League and at the National Academy of Design. He spent most of his career in New York City including memberships with the American Society of Painters and Sculptors, American Artists Congress and the Woodstock Artist Association. Despite his excursions into Cubism and Abstract Expressionism, Benn seems always to have been a ‘subject’ painter. The Academy curriculum stressed portraiture built up with broad, painterly brushstrokes, a technique that remained the foundation of Benn’s style. By his mid teens Benn’s canvases were bolder in color and more decorative in style, the artist also depicted urban scenes, yet, unlike the Social Realists, his work was more an affirmation than a critical commentary on the human condition. Considering this, it is remarkable that he remained visible at all during the 50’s and early 60’s, when prejudice against the representational amounted nearly to a proscription of this kind of artwork. His first important participations were in the Forum Exhibition of Modern American Painters in 1916 as well as the First Annual Exhibition of the Society of Independent Artists in 1917. As a pioneer American modernist, with an independent style, was best known for his bold simplification. 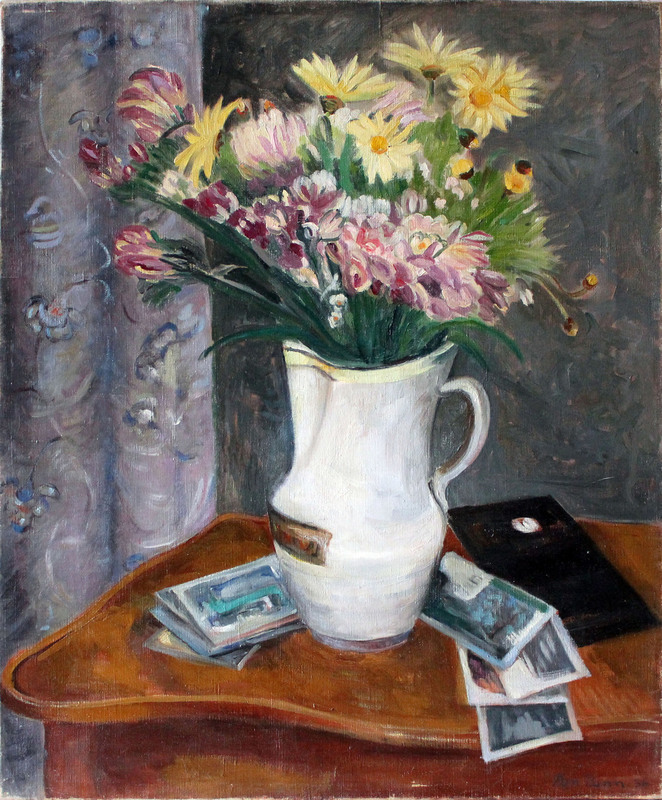 He exhibited extensively including his first solo exhibition which was held in 1925 at J.B. Newman’s New Art Circle Gallery and four at the Babcock Gallery between 1960 and 1970. He also exhibited at Columbia University in 1927, Whitney Museum of American Art from 1927 to 1950, the Corcoran Gallery in 1932 and 1957, and the Pennsylvania Academy of Fine Art in 1942 and 1952. Benn participated in other important exhibitions of American Modernism included “The Decade of the Armory Show: New Directions” in American Art from 1910 to 1920, and the Whitney Museum of American Art's traveling exhibition from 1963 to 1964 and many more. Benn had many solo exhibitions during his lifetime, including one at the Jewish Museum of New York in 1965 and at the Walker Art Center in Minneapolis. Also he was awarded a medal that year at the the Pennsylvania Academy's 147th Annual Exhibition. Today Benn’s works is part of many museums and permanent collections including the Metropolitan Museum of Art, the Museum of Modern Art, The Whitney Museum, Newark Museum, Baltimore Museum, Albany Institute of Art in New York, Butler Art Institute in Youngstown Ohio, the Knoxville Art Center and the University of Minnesota. His prominence in the art world over 6 decades was reaffirmed at a 90th birthday show at the Hirshhorn Museum in Washington, D.C. in 1974. Between his most publicly recognized works are a portrait of ‘New York Judge J. Planken’ that has been at the New York City Courthouse, a ‘Still-Life Painting’ that forms a part of The Kröller Collection in The Hague, Holland, and the piece named ‘End of the Street’ that was exhibited at the Hammer galleries at a solo exhibition shortly after the artist’s death, with the number 36 in catalogue, which became also a part of the collection of the New Britain Art Museum. Benn died in 1983 in Bethel, Connecticut.